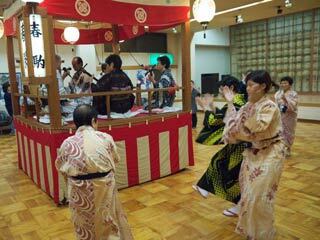 Hotel Gujo Hachiman (ホテル郡上八幡) offers the dance lecture of Gujo Dance (郡上おどり). Gujo Odori is one of the most famous folk dance in Japan. There are 10 different dances, and most of them are played widely in Japan at Bon Odori Matsuri in summer. Hotel Gujo Hachiman has free dance lecture for their guests at night. Time of the lecture: 9:00p.m. to 10:00 p.m.
1. use shuttle bus to Hotel Gujo Hachiman. Make sure ask the hotel about the schedule of the lecture first if they have the lecture when you stay.